This is the first article in my new blog series 'Five Things You May Not Know About....' Each week I will feature a different paralegal...they will come from all areas of the profession and from different areas of the country. The focus will be on their work and also on how they spend their free time. 1. Candy, tell me about yourself and your work. I've been a paralegal for 24 years and currently work for the U.S. Attorney's Office, District of North Dakota, where my title is Paralegal Specialist. I married Jim Reilly in Kauai...our favorite travel destination. The North Dakota winters are long so we spend as much time outdoors as we can during the summer. We like to travel to tropical locations every January or February. 2. What is your favorite thing about being a paralegal? I love the detail work of investigating or researching. I believe it's important to go that extra step to help the attorney in every case I'm working on. 3. What do you consider to be your biggest challenge in doing paralegal work? I am a 'black and white' person. That doesn't always work in the legal field where there are a lot of 'gray' areas. Some issues are very frustrating. 4. Tell me about any volunteer activities you participate in. I'm always available for volunteer work in my community. For instance, I baked for the members of the National Guard who spent a month away from their homes to help build dikes and floodwork in the Fargo area this past winter. I also love to make baskets to auction for various causes, such as for friends in need or the annual basket auction at the courthouse where proceeds go to charities. 5. What do you like to do in your 'spare' time? I love to create something from nothing, such as pots from clays, jewelry from beads, quilts from fabric, etc. I like to make scr apbooks. I started making jewelry about eight years ago in between NALA projects during a particularly boring winter in North Dakota. I started with a few bracelets and was hooked. One thing led to another and I had more bracelets than any one person could wear. A friend suggested that I sell some. That was difficult but she persuaded me and the rest is history. I usually sell the jewelry only to friends or co-workers, but I'm working on a Web Site. I love working with sparkly crystals. Recently I've started working with stones as they have so many different qualities. I've also created one of a kind bracelets, IE football bracelets (every woman needs to 'sparkle' during football season!) and sorority bracelets for my sorority sisters. My creations have also included wedding jewelry for brides and their bridesmaids. This year I began experimenting with metal stamping, metal and rivet jewelry, soldered jewelry and silver wire fusing. I can't wait for warm weather when I can use the garage workshop and fire up my butane torch! 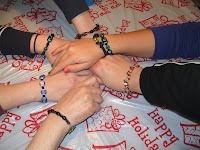 This picture was taken last Christmas when my nieces, my mom and I all made bracelets. Jewelry making can be a great group activity. Earrings are my favorite thing to create. I look for unique beads so each pair is different. I've also made book marks (I call them book thongs) that were a big hit at the office. When I'm out in public or flying somewhere and someone comments on my jewelry, I love to be able to say, "I made it." Since summer is so short in North Dakota, I create fewer pieces in the summer because I want to enjoy the outdoors. 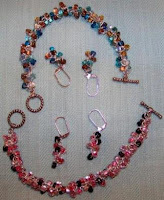 During the Winter months, I search for new beads and try new ideas/creations. And, yes, I do still find time to work as a paralegal...after all, I have to support my hobby! Thanks, Candy, for sharing a bit about your unique self with the Paralegal Mentor World! Ethics Lessons: Let's Get Ethical...Let's Get Technical! Technology rules! This is one truth known to all paralegals and other legal professionals. We have entered the age where nothing is fast enough. Thanks to technology, we can work faster but it does not guarantee we are working smarter. If legal professionals do not allow the time to check their work for accuracy, to ensure security, guarantee confidentiality and protect the attorney-client privilege, they are doing a disservice to the firm and its clients. Are you familiar with the ethics rules that apply to the use of technology in the law firm? Now is a great time to learn those rules and also earn CLE credit.